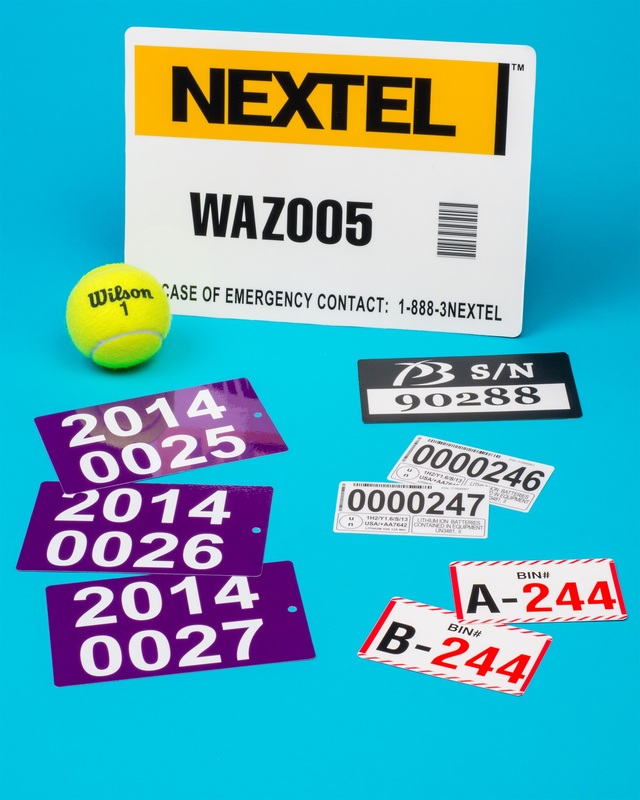 A line of labels that can be custom printed with large consecutive numbers, barcodes, and other images for identifying equipment, bins, facilities, and other items requiring tracking or monitoring is being introduced by Nameplates For Industry, Inc. of New Bedford, Massachusetts. NFi Serial Numbered Labels can be made in virtually any shape, and multi-color design up to 18” x 24” and incorporate consecutive serial numbers and barcodes for easily identifying large items from a distance. Featuring sub-surface printing on the underside of a glossy or velvet finish film, these custom made labels are abrasion-, chemical-, and weather-resistant. Printed from a customer supplied database to sequence an assembly or installation process, NFi Serial Numbered Labels are UL recognized and can be made from Mylar® (polyester) or Lexan® (polycarbonate) with various custom engineered adhesive combinations. These extra large serial numbered labels can include detailed photographic images and other brand-positive identifiers. NFi Serial Numbered Labels are priced according to construction and quantity. Price quotations and free samples are available upon request.